15 points: Read a book by an author who is completely new to you. Completed 5/5/15: Overexposed by Susan Shapiro. 308 pages. 3/5 stars. 15 points: Read a book with “light” or “dark” in the title. 25 points: Read a book that is longer than 500 pages long. Reading 12 books in 4 months is not really a challenge for me since I am doing a separate challenge for 2015 that has me reading at least a book each week. The challenge is to make them all books over 200 pages (lots of novels are shorter) and also to find books that fit these categories. But the benefit of having these categories is to force me to try books I might not otherwise read, for example, I am not really big into series books these days, although there were lots of those in my childhood – Nancy Drew, Sweet Valley Twins, anyone? 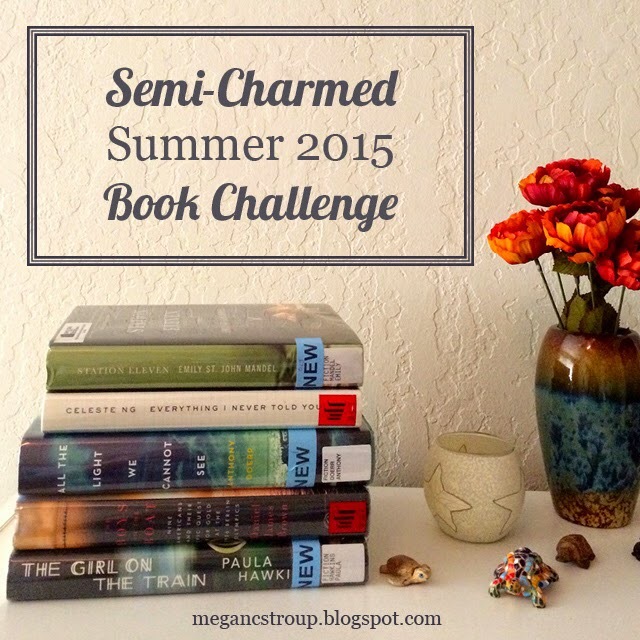 Will you consider doing this or another summer reading challenge? Suppose I started a challenge of my own. How likely would you be to sign up? This sounds like fun! I remember reading in the Summer as a kid, one of the best parts of not having school was being able to read all the books I wanted! 🙂 I was a nerd and I’m cool with it! The kids have reading lists to push themselves; why shouldn’t adults, right? How is your reading going? Are you doing a challenge this year? Great. I was two books shy of finishing the winter challenge so I am determined to complete this one. All the best to you also. I think I’ll join in!!! Awesome! I look forward to seeing what books you choose.